Your presentation was inspiring and I am already using your ideas with my students. 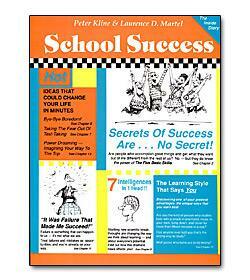 Secrets Of Success Are... NO SECRET! Are people who accomplish great things and get what they want out of life different from the rest of us? NO - but they do know the power of The Five Basic Skills!! Do you? Startling new scientific breakthroughs are changing the way we think about learning - and about everyone's potential. Find out how this dramatic news affects you! Have you ever thought what a snap school would be if you could just remember anything you wanted? Suppose remembering was not only easy but fun?... see chapter 8. Only $24.97.